1. On Monday, U.S. Senators will return to the nation's Capitol for a key test vote on support for a constitutional amendment to control money in politics. The measure (S.J. Resolution 19) would give Congress and the states explicit power to set limits on campaign contributions and spending, including the power to ban campaign money from corporations, unions and other "artificial" entities. S.J. Res. 19 would overturn U.S. Supreme Court decisions equating campaign spending with speech and that the First Amendment prohibits limits on campaign money. In other words, S.J. Res 19 would overturn the terrible 2010 Citizens United vs. F.E.C. decision as well as the even more infamous 1976 Buckley v. Valeo decision which started all of this mess. Half of the 100 U.S. Senators, including Wisconsin's Tammy Baldwin, are co-sponsors and supporters of S.J. Res. 19. Wisconsin's other U.S. Senator, Ron Johnson, ought to be a true "maverick" in our state's finest tradition, and buck his party leadership's opposition to the measure and support it. Here is our letter to Senator Johnson urging him to do just that. You can call Senator Ron Johnson at 202-224-5323 or email him using the contact form here (a phone call is far more effective), and urge him to support S.J. Res19 for Wisconsin! 2. 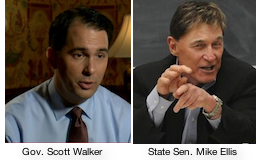 Last week, the widely-touted Marquette University Poll asked Wisconsin residents a variety of questions about the race for Governor of Wisconsin and other elections this Fall. It also asked a question about secret money in Wisconsin, specifically about whether Wisconsin voters favored knowing who was behind the millions of dollars of communications (particularly TV and radio ads) run by outside special interest groups. The statewide Wisconsin Radio Network interviewed CC/WI Director Jay Heck about the poll's findings on campaign disclosure. 3. In 1997, then-State Representative Scott Walker (R-Wauwatosa) introduced legislation that CC/WI supported and which would have required the disclosure of donors to all groups outside of Wisconsin who spent money in Wisconsin trying to influence the outcome of Wisconsin elections. We reported on this in mid-August. Recently, the Shepherd Express in Milwaukee explored this issue in more depth with CC/WI Director Jay Heck and further, compared what Governor Walker may have been doing in 2011-2012 to conceal outside spending with what State Senator Mike Ellis (R-Neenah) merely talked about doing last April before being driven into retirement. 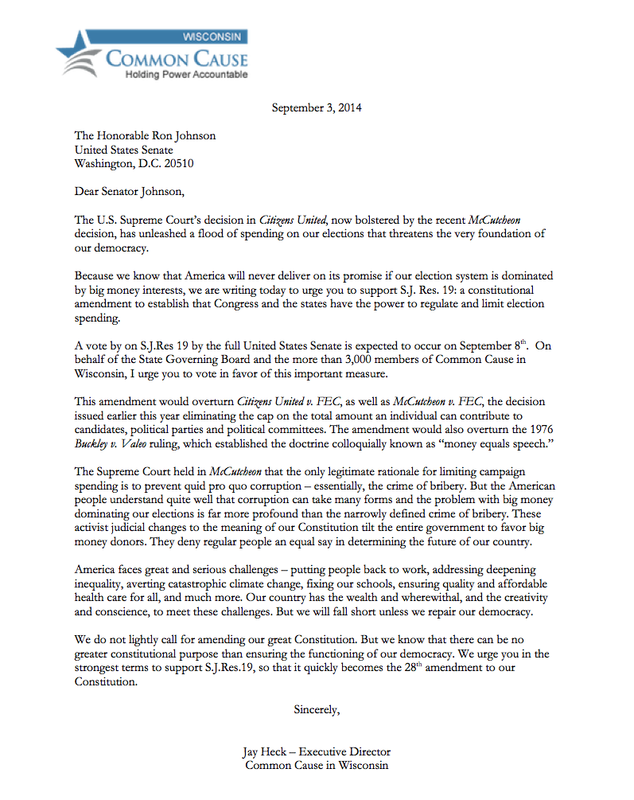 Ron Johnson Should Vote for Key U.S. Senate Measure Monday to Overturn Citizens United DecisionTweet this! Citizens United is a landmark case reaffirming free speech rights for political speech - the type of speech that should enjoy the greatest protections. Limiting the ability to finance political speech is unconstitutional.